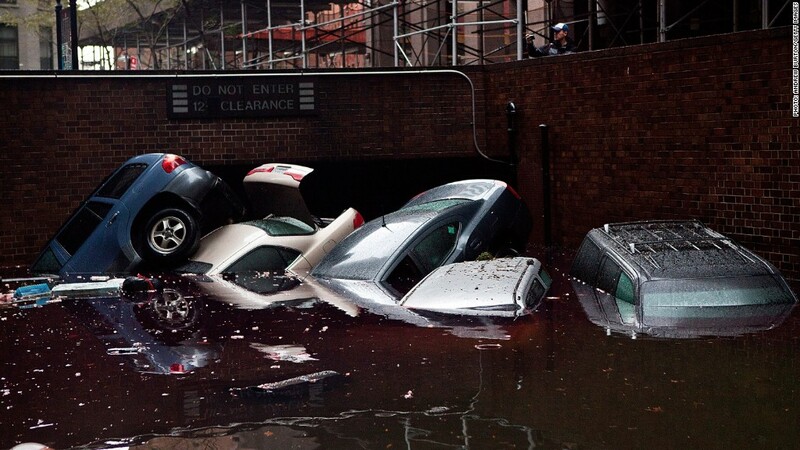 Cars damaged by the flood caused by Hurricane Sandy in New York City's financial district. The impact of Hurricane Sandy on the lives of residents of the Northeast will be great. Millions are without power, likely for an extended period of time. Businesses -- from the nation's stock exchanges and all the way on down to thousands of corner stores -- have been shut down. The total cost of property damage and lost business is estimated to run between $10 billion to $20 billion, according to Eqecat, which provides loss estimates to the insurance industry. Insured losses, excluding those covered by National Flood Insurance, are expected to be between $5 billion to $10 billion. And total losses could go as high as $25 billion including interruption to business, according to estimates by Kinetic Analysis Corp. But economists surveying the immediate aftermath of the storm say there may be little if any impact on the nation's overall economy. The loss of business and wealth caused by the storm will likely end up being roughly balanced out by money that will go into rebuilding and recovery efforts from insurers, the government's national flood insurance program and private savings. "The bottom line is, it's very disruptive, very painful, but at the end of the day these kinds of natural disasters typically don't show up in national economic data," said Mark Zandi, chief economist for Moody's Analytics. "There will be a lot of offsetting effects, both winners and losers. Restaurants get hurt. Grocery stores do better." The same is likely true with measuring the impact on income and jobs. Zandi said the number of workers who are off the job and not being paid because their employer is temporarily shut down will likely be balanced by those working overtime clearing debris, moving a backlog of shipments or helping in rebuilding. Even if businesses in New York City are able to reopen soon, getting their workers back on the job could prove difficult for some time to come, adding to the disruption of business. Chuck Watson, director of research at Kinetic, said full restoration of transit systems could take one to six weeks. Joseph Lhota, chairman of the Metropolitan Transportation Authority, which oversees the city's subway and bus system as well as some of the suburban rail lines and tunnels leading into the city, said the system "has never faced a disaster as devastating as what we experienced last night." New Jersey Transit, which handles commuter rail and buses from that state into the city, said it also suffered "unprecedented devastation." Some rail bridges were hit by boats. One has two boats resting on top of it. Other critical tracks are washed out. Who will end up paying for the rebuilding will determine how much loss of wealth will occur. If homeowners and businesses have insurance policies that cover flood or business interruption losses, it will lessen the economic hit of the storm. But estimates are that only about half of storm losses will be covered by private insurers. And while the federal government's National Flood Insurance Program will fill in some of the gap for flood losses that are rarely covered by private insurers, it won't fill the whole gap. 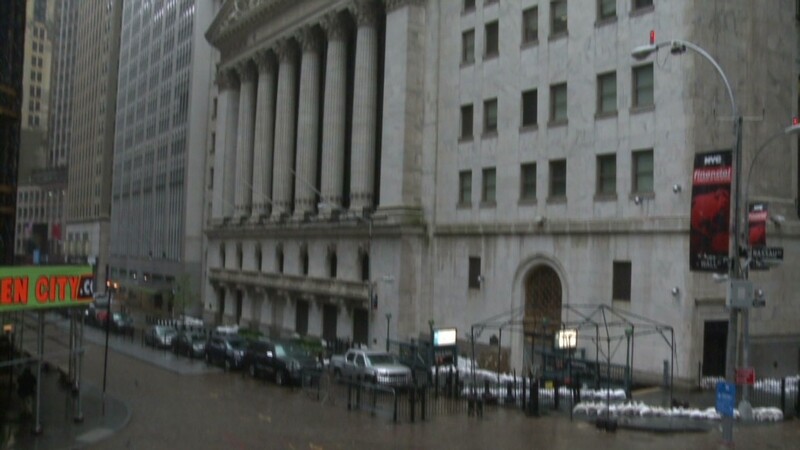 NFIP only paid out $1.3 billion for flooding caused by Hurricane Irene when it cut a similar path of destruction in the Northeast a year ago, according to the trade publication Insurance Journal. Even if insured losses reach the $10 billion that is the upper end of current estimates, the insurance industry is relatively well positioned to pay out covered losses said Neena Saith, director of model solutions for RMS. "I don't think that this will cause any major issues. 2012 so far has been a relatively quiet loss year for the insurance industry," she said. John Silvia, chief economist with Wells Fargo Securities said that he thinks from a perspective of the nation's economic activity, there could be a very slight lift due to Hurricane Sandy. But that will be accompanied by a loss of wealth as those affected have to dig into their savings to pay for repairs not covered by insurance, either because they don't have the proper coverage or they have to pay insurance deductibles. "There has to be some change in spending," he said. "You will be spending the money at Home Depot (HD), but you won't be spending as much shopping for Christmas, or eating out or going to Giants and Jets games." Silvia said many major businesses shutdown by the storm will be covered by business interruption insurance or will be able to make up the lost sales when business resumes. An exception could be the nation's airlines, which have had to cancel 16,300 flights through early Tuesday, according to tracking service FlightStats. "Flights and hotels, there's no way to make that up," he said. But the area that will be even harder hit will be many small businesses that are shutdown for an extended period due to lack of power, Silvia said. "That's going to be a tough loss for many of them," he said. - CNN's Logan Whiteside contributed to this report.